In the last segment of this series, I took everything off the boat that it didn't need. 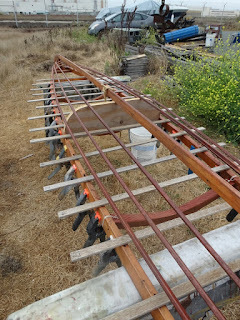 In this segment, I'm putting in new ribs. And I should mention that I didn't break any ribs. I was very careful to not use any of the rib stock that had grain runout. Straight grain the the bending stock is the best insurance against breakage. The rib stock was white oak. Adequate soaking time is also important as is good heat in the steambox. Let's look at some pictures. Here's the steam setup, an electric wallpaper steamer with about a gallon of water in it. 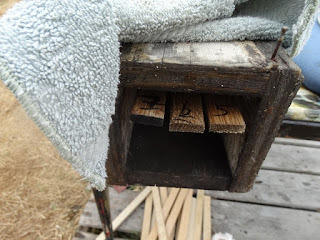 The hose coming out of the steamer goes in the back of the steambox which is nothing more than a plywood box with a towel hung over the front end. The towel allows for a good flow of steam through the box without letting out too much heat. The ribs have been soaked in water for several days. 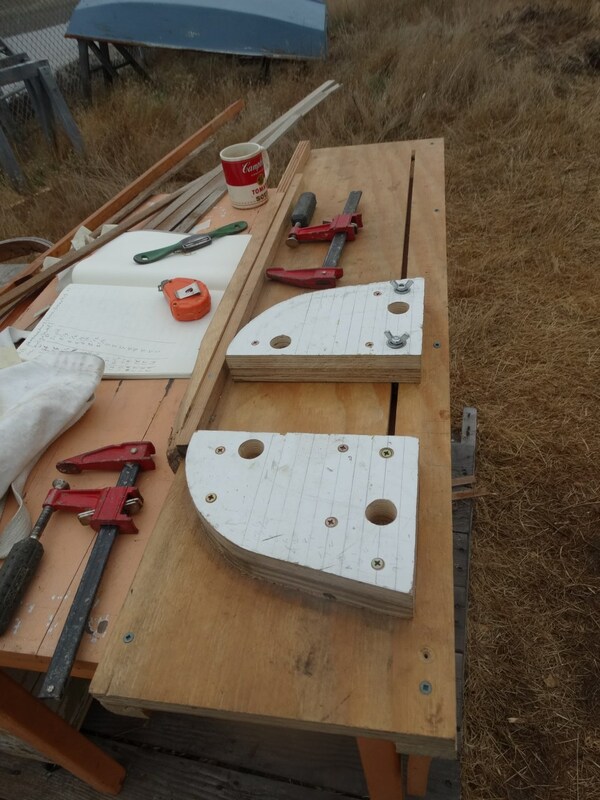 Here they are cut to working length which is about 10 inches longer than the distance between the gunwales at their respective new homes. All the ribs are marked with a number to minimize confusion when several ribs are in the steambox at the same time. 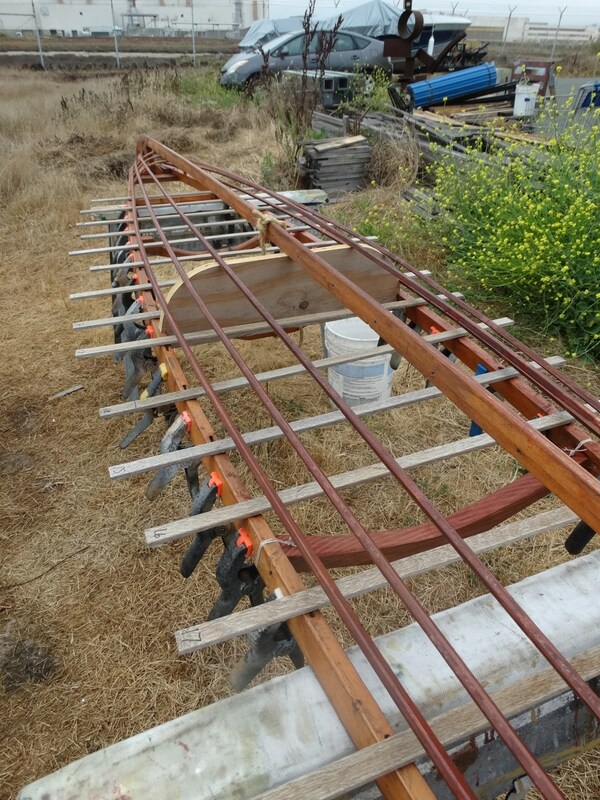 Here's my adjustable bending jig for the ribs. The left wing is stationary and the right wing moves to the needed width. At any one time, I have three ribs in the steamer. 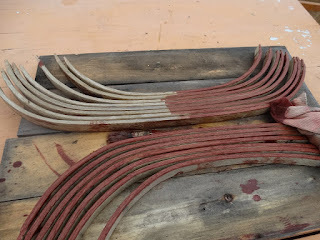 Steam time is not specific, The rightmost rib is the one pulled first, New ribs are fed in on the left so there are always three ribs in the box. 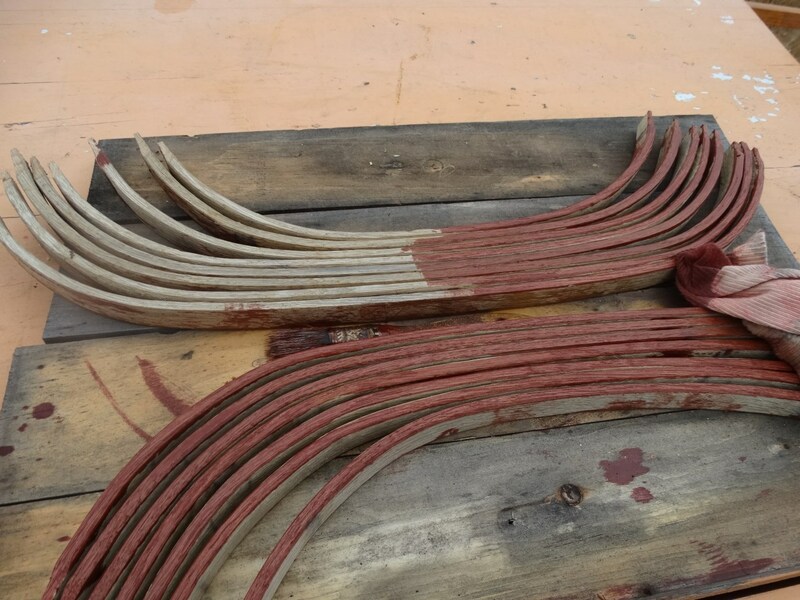 By the time the leftmost rib gets to the right, it is ready to bend. In the meantime, I am clamping the active rib into the bending jig, letting it sit for about a minute to cool down, then removing it, clamping it into the boat and resetting the jig for the next rib. 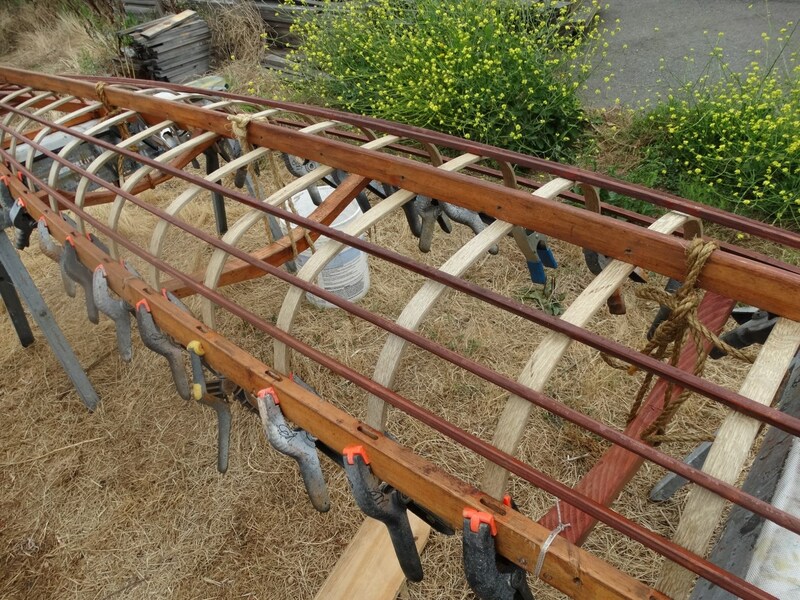 Here are all the new ribs clamped in place. Next I eyeball the ribs from the ends of the boat to make sure they are all clamped in symmetrically. Then I mark them and trim them to their final length and pop them into their mortises. 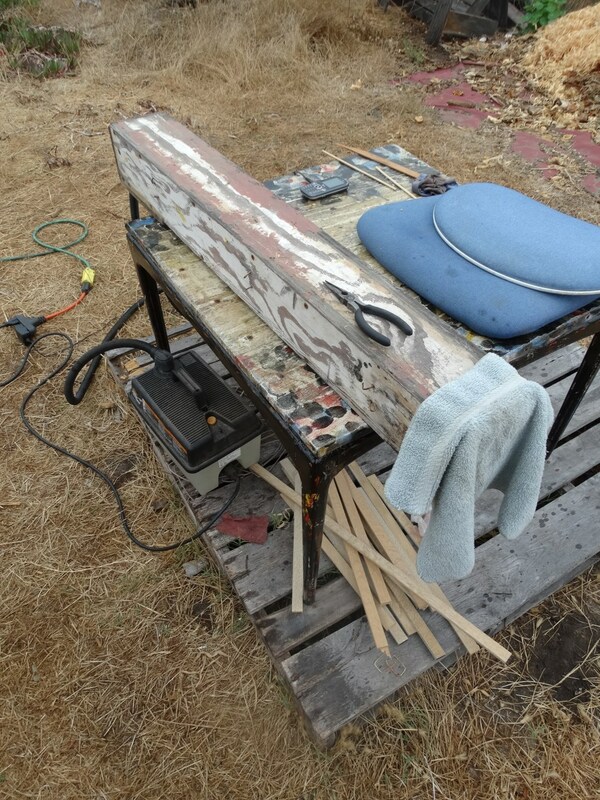 Once the ribs are all in place, I let them sit overnight to dry out and take a permanent set. Then I number them. 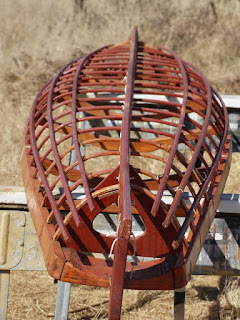 Next day, I pull the ribs out and stain and varnish them which is much easier to do while the ribs are out of the boat than when they are lashed into place. Here's all the ribs in place but not lashed yet. Note that the keelson kicks to the right at the tail end of the boat. We will be fixing that in the next installment of the 14 foot rebuild. After going out fishing in my 16 foot baidarka I decided to make some mods to the decklines to make it a better fishing boat. The mods were not extensive but addressed two particular aspect of the existing rigging that could be improved. 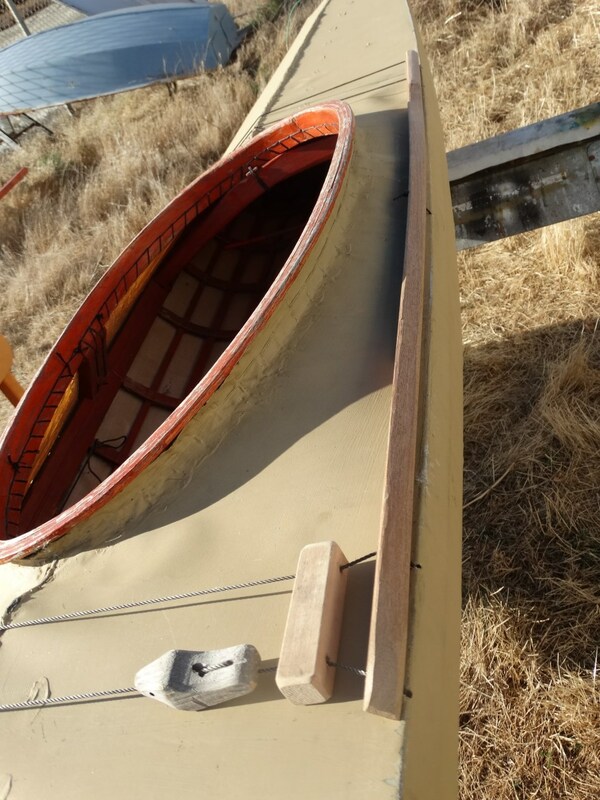 One mod improved the ability to stow paddles on the foredeck. The other mod improved my ability to get out of the boat quickly after landing on the beach. Let's go to the pictures. 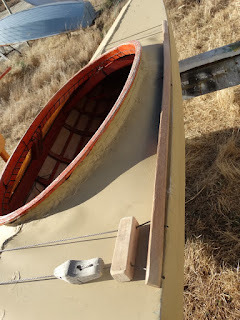 This photo shows a new addition, a longish piece of wood on the left (port) side of the boat. 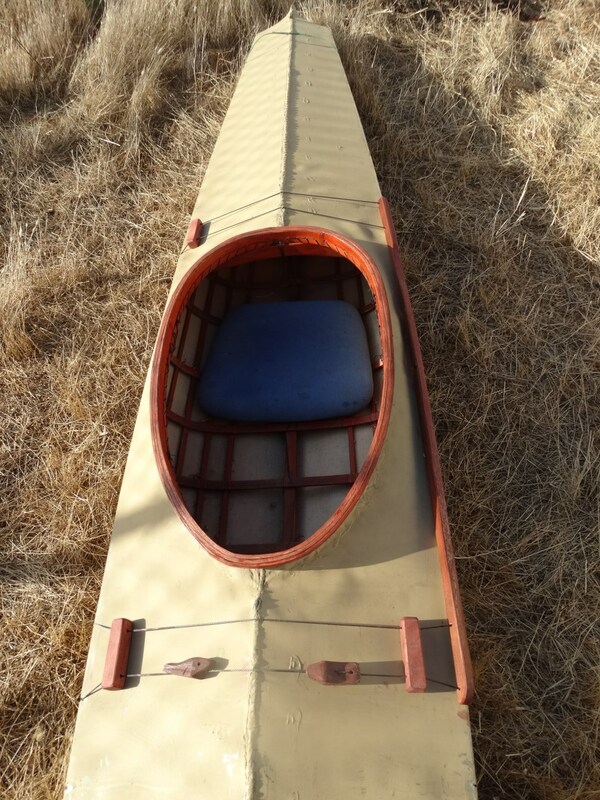 This used to be a feature on Unangan kayaks. 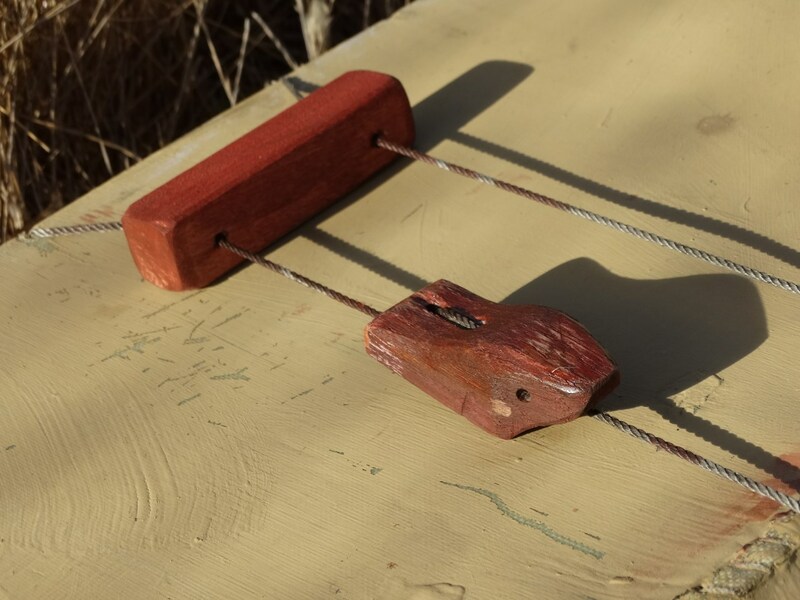 The piece of wood protects the skin from chafing by the fishing line when fisherman pulls in a fish. Chafing of the skin is probably not as big a deal with a synthetic fabric skin as it is with a sea lion skin, but I thought it might be a good idea to have this feature in any case. Deck toggles, the two rectangular piece of wood on either side of the kayak are used to tighten up the deck lines that hold spare paddles in place on the deck. I moved these closer to the front of the cockpit for easier access. Here's a closeup of another deck toggle roughly in the shape of a little sea creature. This is meant to keep a paddle from sliding off the deck when the paddle is just laid on the deck instead of being tucked under the deck lines. One of the problems when landing in surf is the timing of the waves. Even if you time the waves coming in and come in on the back of a wave and make a smooth beach landing, you have to get out of the kayak quickly because the next wave is coming in and is likely to pull you back into the surf. This is especially problematic on steep beaches. With the size of this cockpit and with a lap full of fish, jumping out of the kayak is not easy. I have to hoist myself up onto the back deck so I can step out of the cockpit. I do this by placing my hands on the gunwales back of the cockpit and raising myself up. Unfortunately, the deck is sloped an my hands tent to slide off, so I added toggles in back of the cockpit for a better grip. If you're paying attention, you will also notice that I added another rub guard on the starboard side of the cockpit. I thought that might also help with getting in and out of the boat. 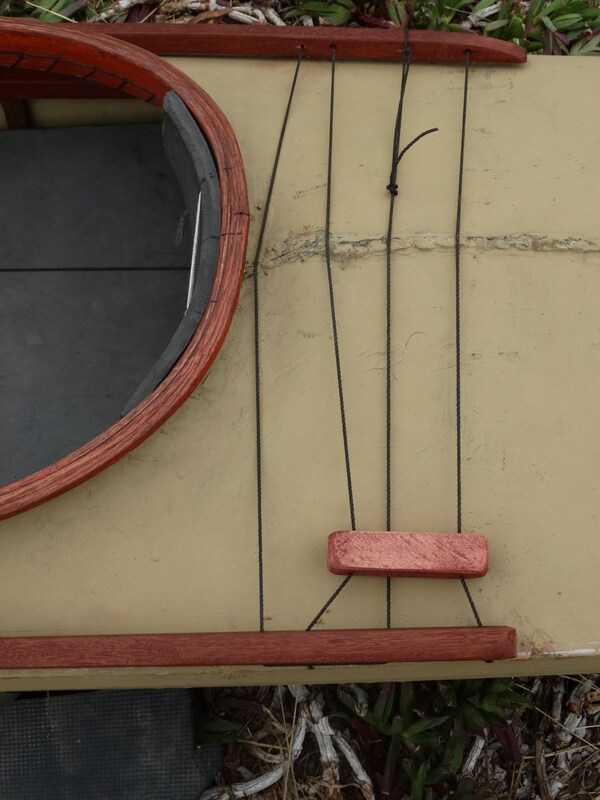 And finally, I ran another line between the two deck toggles to keep them from sliding off the edge of the gunwales when I'm hoisting myself out of the cockpit. I tested all this on the ground. I have yet to try it out on the water where it counts. And finally, I formalized the padding in the cockpit. Previously I just had a foam pad in the bottom of the boat. 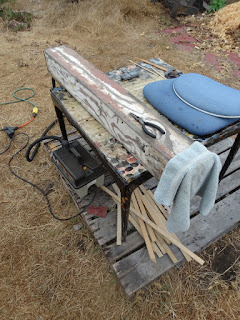 I still only have a foam pad on the bottom of the boat, but now I cut it in half and doubled up on the bottom and tied it to the ribs and I also added a piece of foarm as a backrest. This should help with sitting for hours while fishing. More on the water testing is forthcoming. Stay tuned. Two kayak fishermen took me out fishing with them. I was under the impression that to fish from a kayak you needed lots of gear like rod-holders and landing nets and places to put fish in case you caught some etc. etc. Turns out that according to my mentors, you don't need most of that stuff. You don't need rod holders because you don't need a rod and reel to fish from a kayak. A kayak puts you right on top of the fish and so you don't need a rod to fling your bait or lure out away from your kayak to where the fish are. The fish are under you and so you just lower the line with the bait into the water below you and the fish bite on your bait. It's that simple. The reason this works is that the fish are some distance below you and so they are not spooked as they would be if you just had six feet of water under you. When you have 100 feet of water under you the fish can't see you. So we went fishing and caught fish. The reason we caught fish is that one of my mentors had a gps that took us back to a reef where he had caught fish before. His electronic gizmo also had sonar that showed him what the bottom looks like. We were going for rock fish which hang out over rocks. If you're fishing where there are no fish, you catch no fish. Most likely you blame yourself or your bait but the real reason you caught no fish is that you were fishing where there were no fish. Here's the Pacific at 7 a.m. Not much wind but some shore break from 3 foot swells. Our put-in point on a shelf some fifty feet above the beach. 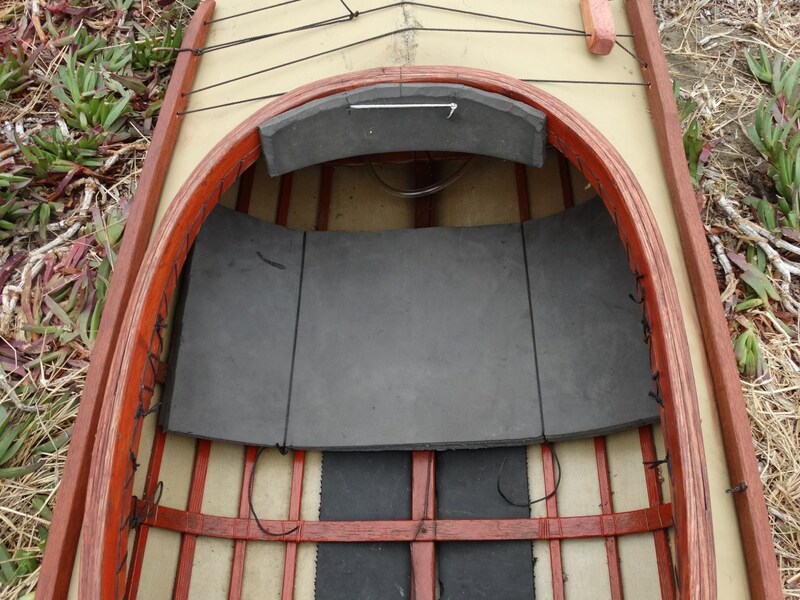 Portaging of the kayaks was required. My host's fish counter. The leg of the string on the left is total fish caught. The leg on the right tracks a different species that has a different limit from the run of the mill rockfish. The rig, 300 pound braided line with a lead weight and some hooks wound on a wooden spool. What could be simpler? I should mention something that I noticed before when starting to fish with my canoe is that fishing changes your relationship with your boat and the place where you take your boat out. Fishing, in this case changed my view of my kayak as a means of putting me into the ocean's food chain, one step above the rock fish but still one step below the sharks that live in the Pacific. As a consequence, I made some mods to my kayak to make it a better fishing boat. More on that in a separate post.